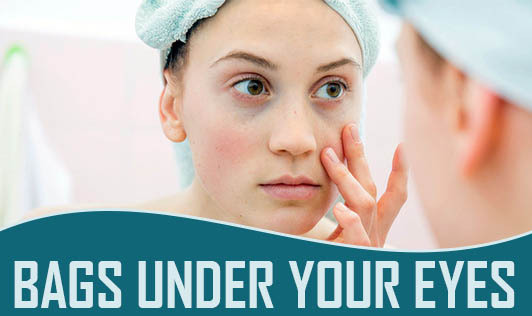 Many of you might be concerned about 'bags' under your eyes. Here are some causes and remedies. * Elevate the head slightly when you sleep. If the puffiness is due to fluid retention, this will help to drain out the fluid. * Get your beauty sleep of 7 to 8 hours every night. * Keep alcohol for special occasions. Do not drink excessively. * Get help for your nasal allergy or sinus problem, if any. * Use make-up to temporarily cover-up the puffiness, if you have to. * Keeping used tea-bags, cucumber slices, etc. on your eyes provides temporary relief. * We cannot undo the process of aging but our lifestyle can take care of our skin to a large extent.